Slap shot some oyster crackers in your soup or score a hat trick of mini marshmallows in your cocoa with the Hockey Mug With a Net. "The world would be better if we could play with our food!" That's the maxim of Max, the kid entrepreneur and sports fan who created this functional and fanciful mug for hockey fans. The mug itself is shaped like a hockey puck, adding a power play of sport-specific detail. Made in Thailand. Make it a collection with The Mug with a Hoop, The Mug with a Goal, The Mug with a Glove, and The Mug with a Goalpost . 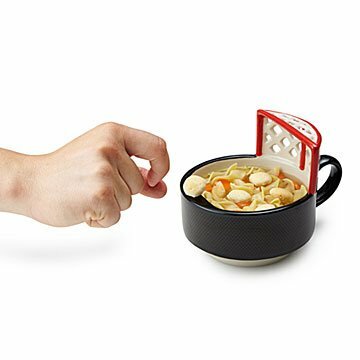 This playful hockey-themed mug features a net to let you play with your food.